Amish handcrafted cedar chest kits make wonderful woodworking projects, and beautiful gifts to your loved ones. 1 paneled front 16 1/8 x 40 1/2"
1 aromatic back 16 1/4 x 40 3/4"
2 paneled ends 16 1/8 x 17 3/4"
1 aromatic floor 17 x 40 3/4"
1. Check small nails on inside of the ends and sides. Set (sink) any that protrude. Fill holes with colored wood filler. for hardwoods: 80, 100, 120, 150, 180 grit and finer if you wish. Blow off excess dust, especially in groves. 3. If using only two clamps, lay front panel face down on clean, smooth surface. Extend one end over the end of work bench. Apply glue to that mitered joint and set in one side panel. Using a shim the length of the joint, gently tighten a 2' clamp over the shim at each end of the joint. Check joints for good alignment. Set 1 hour. Remove clamps, extend the other side of the front over end of work bench. Slide the floor into position, best side in. Do not use glue in floor groove. This allows for movement. Repeat glue and clamping process for second side panel. Glue and clamp back in place. 4. If using 6 clamps, lay front panel face down on clean, smooth surface. Apply glue to both mitered joints and set in one end panels. Slide the floor into position, best side in. Do not use glue in floor groove. This allows for movement. Set in other end panel. Apply glue generously to free joints on side panels. Set in the back, best side in. Carefully stand assembled chest upright and apply pipe clamps, using long shims under them to span the entire joint being glued: two - 2' clamps across top and bottom of each end and two - 3-4' clamps across top and bottom of back of chest. 5. After glue is set, for extra strength in the corners, pre-drill nail holes through the ends into the front panel and through the back into the ends. Counter sink finishing nails and fill holes, as well as any joints with gaps. 6. Sand down entire chest to desired smoothness, easing sharp edges. 7. Fit the molding trim one piece at a time, starting with one end. Miter front end of the trim piece. Do not cut to length until corresponding end of front trim is mitered and you has a good fit. Then cut the end piece to length, over cutting a bit to allow for finish sanding. Pre-drill holes for nails on the end trim. Glue, clamp and nail trim to chest. Miter other end of front trim piece to fit. Pre-drill holes for nails. Glue, clamp and nail front trim in place. Miter last end trim, and fit it to the front. Cut to length, over cutting a bit to allow for finish sanding. Then attach as for others. 8. Use screws to attach feet to chest, as well as glue. Pre-drilling screw holes is suggested but optional. Attach metal glides. 9. Position the support rails on under side of top, about 4" from each end and so they do not interfere with closing the lid. Screw on, using 1 1/4" screws. Do not use glue, to allow for wood movement with changes in humidity. Attach the brass hinge to back of lid, pre-drilling holes with 1/16" bit. Have a helper hold the lid up to center it on the chest. Insert only one screw in one of the hinge, close lid and check for proper alignment. Make necessary adjustments, then attach one screw in other hinge and check again for proper alignment. Make necessary adjustments, then insert remaining screws. 10. 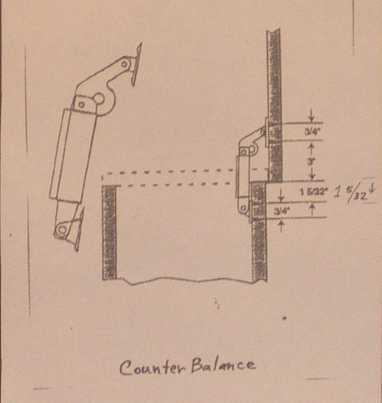 To attach counterbalance, follow measurements on diagram. If lid locks up before completely closed, raise the screws on the lid. Any questions or suggestions? Just call and ask for Dale or Kathy. 1. Mark a center line on inside top edge of chest. On inside, lay lock's brass case against wood and trace outline with fine-tipped pencil. 2. Set in the lines with Chisel (I use a 1 ½" wood chisel), cutting cross grain on left and right sides first, then across bottom. Then chisel out mortise, using various sized chisels, whatever fits the work, testing lock frequently for fit. 3. Lay lock upside-down on top edge of chest and trace the outline. 4. Lightly set in the pencil lines with wood chisel; make cross grain cuts first. Check lock again for fit. Chisel out the mortise. 5. Drill keyhole with 3/8" bit. Use rasp for fine adjustments until key fits into lock. 6. Screw in the lock casing. 7. To position the clasp, first lock it in to the lock casing. Then firmly close the lid so the prongs mark where the lock lines up with the lid. Unlock the clasp; mark and drill its screw holes. Trace and chisel out to set in the clasp. Screw it in.